With only two weeks to go before ACI ’s April 20 Annual Benefit Reception, Building Student Succeess Through the Liberal Arts, it’s time to purchase tickets to attend this exciting event at the University Club of Chicago. Tickets are $175 per person and are available via the ACI website registration page. The Annual Benefit Reception raises funds to support ACI’s Peer Mentoring Program, which seeks to raise college graduation rates among underserved students, including low-income and first-generation students and students of color. Now active on nine ACI-member campuses, peer mentoring matches students with trained peer mentors recruited from upper classmen of similar socioeocnomic backgrounds. Mentors help their mentees navigate the critical first year of college and boost their chances of persisting through the next three years to graduation. ACI’s April 20 Benefit Reception offers guests cocktails and hors d’oeuvres, with entertainment provided by musicians from Chicago Sinfonietta. A brief program will feature messages from Ana Dutra, left, CEO of The Executives’ Club of Chicago, and Dr. Jamel Santa Cruze Wright, right, Eureka College’s 27th president and the first woman and African American to preside over the 163-year-old institution. In addition, peer mentors from Quincy University, Quincy, and Rockford University, Rockford, will share their experiences supporting students enrolled in ACI’s Peer Mentoring Program. ACI’s 2018 Benefit Reception is sponsored by Patrons Gallagher and Husch Blackwell and by Partners Aon, Baker Tilly, GROWMARK, Robbins Schwartz and UPS. Visit ACI's website for information about sponsoring the event and for information about publishing greetings in the program book. ACI's March 23 Career and Internship Fair attracted 170 attendees, providing a rare opportunity for students from 13 ACI colleges and universities to meet 23 employers face-to-face and connect with experts in career development, diversity and networking. ACI presented the day-long event at North Central College, Naperville, in partnership with Citi. Major funding was provided by a Council of Independent Colleges National Venture Fund Challenge grant of $21,750, matched by a gift from the Shure Family Charitable Trust. ACI’s fair reached beyond standard career fairs to give students opportunities to interact with employers in both the traditional “employer expo” setting and in less formal settings, including sitting with them at a keynote luncheon and relaxing with them in a networking lounge. In addition, the fair offered seminars that equipped students with skills and information to enhance their job searches and on-the-job performance. Skill-building sessions included advice for job seekers, in-person networking (sponsored by GROWMARK, Inc.), workplace diversity (sponsored by the Financial Services Pipeline Initiative), first-time job searches (sponsored by Baker Tilly) and using LinkedIn to effectively market to prospective employers. Speakers from ACI colleges and universities included James Godo, North Central College; Jerry Pinotti, Concordia University Chicago; Maribeth Hearn, University of St. Francis; and Reneé Tucker Martinez, North Park University. The luncheon keynote speaker was Robyn Clark, right, managing partner and founder, SuccessWise Consulting, Inc. She advised students: "Nobody ever hires you for what you've done in the past. People hire you for what they believe you can do in the future." Clark also presented a list of nine "Winning Action Strategies" for students entering the workforce: Be Essential, Push Yourself, Exercise Confidence, Build a Fan Base, Practice Regular Self Reflection, Give Back, Negotiate for Success, Always Have a Plan and Understand the Game. 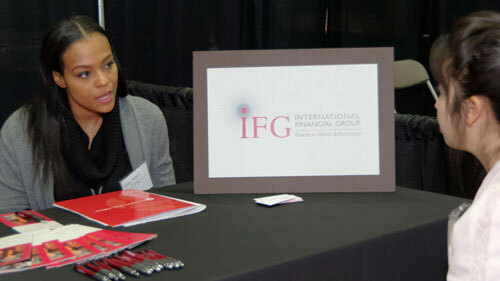 At the fair’s two "Employer Expo" sessions, students met face-to-face with employers ready to hire. Representatives from companies such as Essendant and Whole Foods said they spoke with dozens of candidates. Sara Lorenzo, talent development supervisor, TTX Company, said she identified some good prospects. Her firm maintains a highly valued internship program, which hires 30 students each summer. 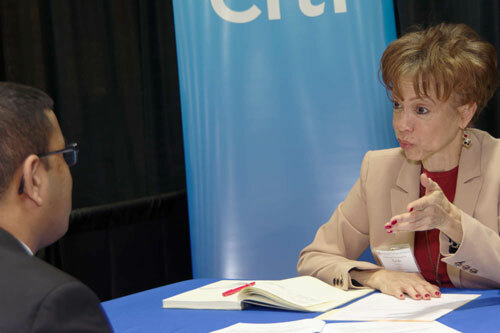 Leah Wallace, right, Citi’s vice president of workforce development and diversity and inclusion, who staffed the company’s expo booth, said Citi is committed to hiring students from liberal arts colleges and universities. Citi’s "Talent Track" program, launched in 2016 and focused on new graduates, she said, is "proof that liberal arts students are committed to work and are valuable assets to our organization." Citi will be hiring a second cohort for the program this year. Dr. Arvid C. Johnson, president of University of St. Francis, Joliet, spoke about his own undergraduate liberal arts education at Lewis University, Romeoville. Johnson said courses for his physics major and courses in other disciplines were equally valuable to his education. "What I hope for each of you is that you will take advantage of the courses not just in your majors, but out of your majors," he told students. Ashley Maurer, left, a junior math and economics major from Monmouth College, Monmouth, traveled three hours to attend the fair. She said the experience was worth the drive. "I found companies that I honestly didn't know existed before today," said Maurer. "I definitely found options that I may not have even considered before this, which is kind of eye-opening. I liked that a lot." Frustrated by applying for jobs online and by seldom getting a chance to speak to employers directly, Joseph Schomer, a junior accounting major at the University of St. Francis, Joliet, said the Employer Expo was refreshing. "I love coming to these events, even if nothing happens," he said. "There's still a connection and a chance to talk to somebody." Augustana College accounting and finance major Brandon Schattner traveled from Rock Island. He graduates in May and is looking for a full-time job. Employer Expo companies were very receptive to him and open to a variety of majors, he said. Plus, Schattner liked the interactions with the employers. "They're thinking about us as students, our career paths and what would be best for us, as well as thinking about what's best for them," he said. "We don't have many opportunities to meet with Chicago employers," said Kristen Liesen, director of experiential learning, Quincy University, Quincy. "The opportunity to learn about Chicago jobs is wonderful." Liesen and four students left Quincy at 3 a.m. to attend ACI’s fair. Transportation grants provided by ACI to member institutions to bring students to the event were helpful, she added. Jerry Pinotti, director of career services, Concordia University Chicago, said ACI’s fair gave students practice telling their stories and exploring career aspirations. "This event gives them the opportunity to meet a lot of different people," he said. "It gives them confidence. It gives them something to look forward to, to prepare for. It makes our jobs a lot easier." "What really struck me was ACI had some superb employers here. I've never been in a venue where students have been able to hear so many different employers," said Doris Haugen, director of career development, Judson University, Elgin. She planned a follow-up meeting with Judson attendees. Plans are already underway for ACI's next Career and Internship Fair in fall 2019. Early feedback from employers and career services staff at member colleges and universities suggests that fall is a better time for employers to identify summer interns and potential employees, and to give students an early chance to launch employment searches. ACI expresses special thanks to North Central College, President Troy D. Hammond, Troy Bristow, director, conference services and camps, and the North Central College events staff for their important contributions to the success of the 2018 Career and Internship Fair. When she was very young, Isabella Anderson was humming and singing before she understood words. Growing up, singing in choirs and joining musical productions seemed natural. Those experiences, with coaching and plenty of practice have helped this Eureka College senior from DeKalb, Illinois, to earn a bachelor's degree this May in vocal performance, theater arts and drama, with a minor in Spanish. When considering colleges, Anderson assumed that a career in the performing arts meant studying at a larger school or conservatory. But an admissions counselor at Eureka College invited her to visit, and she found a school that provided an individualized experience and made it possible for her to perform on stage. "Here I can do all that," she says. "Just having the opportunity during my undergraduate education to take on these larger projects -- that’s something I know I would never have been able to accomplish anywhere else." Among her accomplishments: directing a production of "Sweeney Todd: The Demon Barber of Fleet Street," working in the chorus of a professional opera with the Peoria Symphony Orchestra, and this spring, her senior voice recital. Plus, Anderson earned a Durward Sandifer Fellowship from the College, which provided a mentoring and internship experience for her at Footlight Players youth theater company in Indiana, Pennsylvania, helping young campers stage musicals and plays. Like many in the field, Anderson dreams of singing and performing on the world's biggest stages, but knows it takes hard work and "baby steps" to get there. This year, an emergency grant from the McGraw Foundation from ACI is helping her complete her education. "“I was lucky to be chosen for that," she says, explaining her parents needed help to finance college educations for her and her brother at the same time. "I was unsure how I was going to be able to move on with my life had this grant not come at the right time. Without that scholarship, I wouldn’t be able to be in school." "I was having trouble finding money. Where was I going to get money to for the next semester of school? Then they found the ACI scholarship for me." Tyler Fisher is excited about music -- all kinds of music. "I like the rhythms of gospel music, I like hip hop, I like rap, and I like country music. I like how country music tells a story," says Fisher, a sophomore at Greenville University, in Greenville, Illinois. Fisher, from Houston, chose Greenville University thanks to the influence of cousins who have attended and because he was recruited to play football. But after one season on the gridiron, Fisher decided to concentrate on his career. "That's when I really focused on music," he says. "A big reason I came to Greenville is that its audio engineering program is second to none." Fisher's major in music business and audio engineering is not surprising. Musical influences have surrounded him most of his life. His father has a large record collection, facilitating his introduction to a variety of musical styles at a young age. His mother played in the high school band, and his older brother, Durrell Jr., makes music found on Apple Music and Spotify. Fisher wants to become a recording artist. "Music has always been there for me. I've been making music since I was about 12. I knew this is what I wanted to do," he says. Fisher continued his pursuit of a degree and a career in music with the help of an ACI General Scholarship the university awarded him in the second semester of his freshman year. "I was having trouble finding money. I was in the financial aid office every day. Then they found the ACI scholarship for me. I probably wouldn't still be in school without it because I wouldn't have been able to get the money from anywhere else," he says. When he's not making music, Fisher serves on the Greenville University executive board for Mosaic Scholars, a campus group devoted to promoting diversity. And, of course, he helps with the university's GospelFest! and is a sound engineer and plays in various campus bands. Students who visit Judson University in Elgin during campus visit days and preview days usually meet current students, plus faculty, staff and perhaps, administrators such as the university president, Dr. Gene C. Crume Jr. What surprises them is Crume gives them his cell number. "I tell them if you have a question or concern, text me or give me a call," he says. "I know they can do the same thing with other faculty and staff at our institution." It's a practice typical of the Judson University community, Crume says, where faculty, staff and administrators know students by their names, backgrounds and interests. It's a place where the university staff helps students identify their vocations, their callings in life. "We will help you graduate on time and find meaningful work once you graduate," Crume says. It's also a place where students grow as people and in their faith lives. Illinois College, Jacksonville, and Augustana College, Rock Island, will be sites for ACI professional development conferences in June, for staff of ACI member colleges and universities. 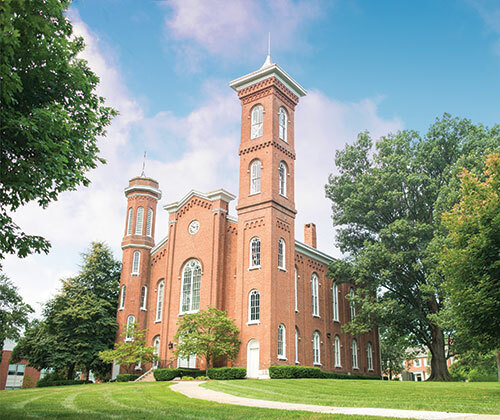 Illinois College will host a multi-track conference Friday, June 1, for professionals in advancement, finance and student engagement. Dave Tretter, president of the Federation of Independent Illinois Colleges and Universities, Springfield, and Donald Fouts, the federation's president emeritus, will kick off the conference as keynote presenters, said Constance Willoughby, ACI director for conferences and scholarships. Among other planned discussion topics are student retention, community engagement, Title IX training, tax reform and planned giving, financial wellness, online classes and master planning. Registration for the conference will open this month. For public relations and marketing professionals, ACI is partnering with Augustana College and its annual Summer Get-Together on Tuesday, June 19. The communications conference will feature presentations by Dr. Anne Marie Mitchell, Columbia College, Chicago, on using social media in a college environment, plus best-practices topics such as branding, digital marketing, planning for a college name change, revitalizing a college magazine, crisis communication and other topics. Click here to register. Michael W. Sonnenfeldt, founder and chairman of TIGER 21, and an accomplished serial entrepreneur and philanthropist, will address The Executives' Club of Chicago on May 8 regarding what it takes to be a successful entrepreneur. The event featuring Sonnenfeldt is from 11:15 a.m. to 1 p.m., at The Metropolitan, 233 S. Wacker Drive, 66th Floor, Chicago. ACI is an event sponsor. Sonnenfeldt is author of the recent book, Think BIGGER and 39 Other Winning Strategies from Successful Entrepreneurs. Along with personal anecdotes, Sonnenfeldt will discuss his book and share stories of self-made executives, concluding with important takeaways on how these thought leaders and entrepreneurs were successful while being change agents. Following his presentation, students studying entrepreneurship at ACI colleges and universities will have an exclusive opportunity to meet with Sonnenfeldt. They will convene at 1871, Chicago's center for entrepreneurship and technology, at the Merchandise Mart downtown. 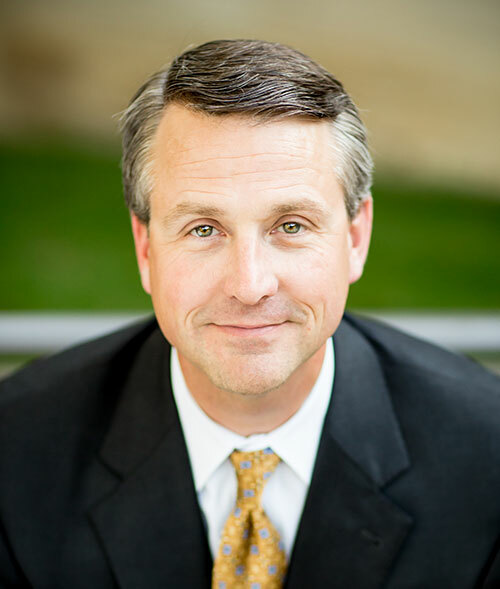 President Kurt Dykstra of Trinity Christian College, Palos Heights, will welcome Sonnenfeldt and the students. A private evening reception for Sonnenfeldt with ACI board members, presidents and invited guests will be held at the University Club of Chicago. Support for the TIGER 21 events is provided through a Capacity-Building grant from the Council of Independent Colleges (CIC) with support from the UPS Foundation. TIGER 21 is made up of more than 600 members who collectively manage more than $60 billion in personal assets. Founded in 1999, TIGER 21 now has 40 groups in more than 25 cities across the globe. A liberal arts education challenges and encourages students to be creative and confident people, and prepares them for future careers which may not yet exist. These qualities are what makes liberal arts graduates desirable employees, presidents of two ACI-affiliated colleges told a Chicago audience. Dr. Teresa L. Amott, president of Knox College, Galesburg, and Dr. Patrick E. White, president of Millikin University, Decatur, presented "What Employers Want, We Do: Liberal Arts and Workforce Development," Feb. 21, at the City Club of Chicago. More than 225 business and political leaders, educators and alumni of the colleges attended. Both presidents pointed out that liberal arts education involves broad training in a variety of subject areas. Plus, liberal arts students learn how to apply their skills through internships, study-abroad programs, research and community-based learning, Amott said. She also said that liberal arts institutions teach skills that help students fit into future careers which may not be known today. "Faculty nurture and mentor young people and help them find a future we cannot chart," she said. "Sometimes those students graduate and go on and create a new world ... Our graduates are sought after by employers because they bring the skills of the future into the workforce." Liberal arts education builds students into lifelong learners and valuable employees by challenging and encouraging them, White said. "At ACI institutions, we want our students to leave our colleges with the self-knowledge that they can be successful, to have the ambition to take on more and the habits of exercising these various virtues," he said. Liberal arts students "gain the largeness of mind and heart that comes from confronting large issues, complex problems and the ambiguities of human experience in an environment where what they think about these things matters to everybody around them." If you're an employer, let ACI help you find staff and interns to help you build your talent pipeline! ACI is posting jobs and internships on the ACI website that will be seen by many of the 65,000 students ACI serves at 24 member colleges and universities. Posting a job or internship is easy -- visit ACI's website, complete the form we've provided for employers, send us your company logo, and we'll post the announcement for free. Staff in career services offices at member colleges and universities are encouraging students to visit the ACI website to search for jobs and internships. Questions about ACI’s Jobs and Internships webpage should be directed to ACI Executive Director Mick Weltman at mweltman@acifund.org or by calling 312-263-2391, ext. 0523. ACI welcomed two new corporate members to the ACI Board of Trustees in February -- Mark T. Neil and Watchen Nyanue. Both nominees were approved by the ACI Executive Committee. Neil is founder and principal of Mark T. Neil and Associates, a law firm concentrating in probate, trust and estate planning and is of counsel to the Rothman Law Group. Nyanue is a marketing and business development expert from Liberia. She is vice president of marketing partnerships with the Chicago Sky WNBA team. Please welcome these two leaders to the ACI Board of Trustees! We mourn the passing of our former board member, Nicholas Amatangelo of Barrington Hills, Illinois, on March 15. Amatangelo was a former president and CEO of Bowne & Co., Inc. He was president and CEO of Bowne of San Francisco, Bowne of Houston and Bowne of Chicago, which included Bowne companies in Detroit, Milwaukee, Minneapolis and St. Louis. Amatangelo served on the boards of several Chicago organizations, including the ACI Board of Trustees. Services were held March 24 in Barrington. 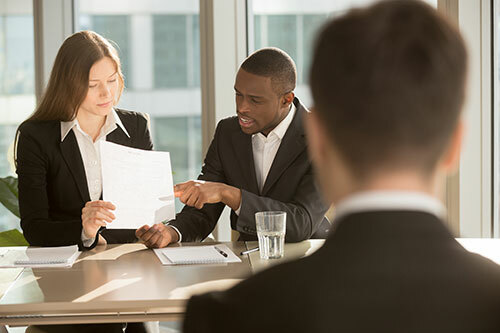 At PNC Institutional Asset Management®, our mission is to help guide corporations, governments, non-profits, and other institutional investors to solutions that optimize the steps in investing and retirement. Our culture, service and solutions differentiate and create value. We stand for trusted relationships, thorough execution, specialized capabilities, and actionable insight. Please read our most recent market update called, “Endowments and Foundations: 2017 in Review” that explores the executive summary of the 2017 NACUBO-Commonfund Study of Endowments® (NCSE), covering July 1, 2016–June 30, 20171. The study gathers data from 809 U.S. colleges and universities regarding their investment programs. Here we review the current state of endowments, focusing on returns based on asset allocation and endowment size, using preliminary information from the forthcoming full 2017 NCSE, published by the National Association of College and University Business Officers (NACUBO). 1Reprinted from 2017 NACUBO-Commonfund Study of Endowments. © 2018 National Association of College and University Business Officers (NACUBO). 1110 Vermont Ave, NW, Washington DC, 20005. Your gift to ACI can help provide scholarships to underserved students or provide support for peer mentoring for low-income, first-generation college students at ACI-affiliated colleges and universities. Financial gifts are tax deductible as provided by law. To provide financial support for ACI Scholarship and Peer Mentoring Programs, please visit the ACI website or contact Mick Weltman, ACI executive director, at 312-263-2391, ext. 0523 or mweltman@acifund.org.